Click here for RSVP and ticket purchase options. email benefit@opencity.org with any questions. 1. 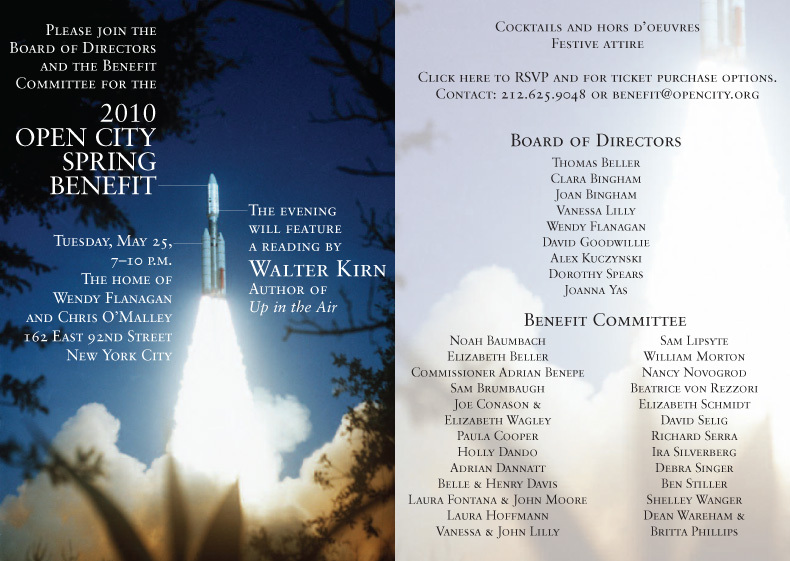 If you would like to reserve your tickets and pay at the door, send an email to benefit@opencity.org with your name, the name of your guest(s), which ticket option you'd like (see below), and your phone number. We'll hold spots for you and you can pay by credit card or check at the door. 2. If you prefer to pay in advance, either print out the below form and mail to: Open City Benefit, 270 Lafayette Street, Suite 1412, New York, NY 10012. 3. Call 212.625.9048 to pay by credit card over the phone. 4 To pay by PayPal, click next to the option you'd like.. Please see the below ticket options. __Please check here if you’d like a writer to receive one of these tickets. Open City is a 501(c)3 nonprofit organization. All contributions are tax-deductible minus the $30 fair market value of each ticket. Written acknowledgement of all contributions will be provided. All tickets will be held at the door. 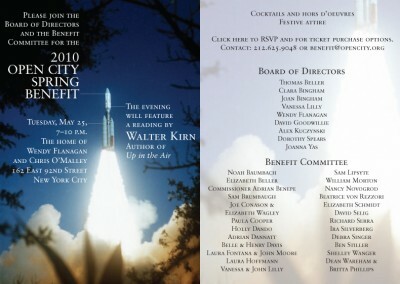 Please call 212.625.9048 or email benefit@opencity.org with any questions. Sam Brumbaugh was born in Washington, D.C. He was a founding partner and creative director of SonicNet. He has been the talent executive and producer for a number of music-related shows for PBS and Canal Plus, and is currently producing a documentary on the life and times of Townes Van Zandt. He lives in New York City. Rachel Sherman was born in 1975. She holds an MFA in fiction from Columbia University. Her short stories have appeared in McSweeney’s, Open City, Post Road, n+1, and StoryQuarterly, among other publications, and in the book Full Frontal Fiction: The Best of Nerve.